Active member of « ISIM » (International Society for Improvised Music) and prize-winner of the aucience’s award at Versailles’s Conservatory Improvisation Competition (France), he attaches a lot of importance to this discipline. It is a real joker for him, that he uses in most of his concerts, and that he also uses as a pedagogic support with his students. 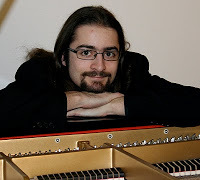 He now teaches both piano and improvisation at the Musich School of Chateau-d’Oex, Switzerland, where he also conducts a choir and a brass band.